Zoonotic diseases – pathogens transmitted from animals to people – offer particularly challenging problems for global health institutions and actors, given the complex social-ecological dynamics at play. New forms of risk caused by unprecedented global connectivity and rapid social and environmental change demand new approaches. 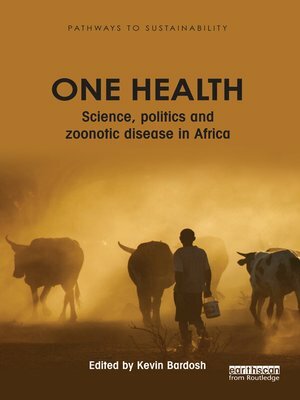 'One Health' highlights the need for collaboration across sectors and disciplines to tackle zoonotic diseases. However, there has been little exploration of how social, political and economic contexts influence efforts to 'do' One Health. This book fills this gap by offering a much needed political economy analysis of zoonosis research and policy. Through ethnographic, qualitative and quantitative data, the book draws together a diverse number of case studies. These include chapters exploring global narratives about One Health operationalization and prevailing institutional bottlenecks; the evolution of research networks over time; and the histories and politics behind conflicting disease control approaches. The themes from these chapters are further contextualized and expanded upon through country-specific case studies – from Kenya, Zambia, Nigeria, Ghana and Sierra Leone – exploring the translation of One Health research and policy into the African context. This book is a valuable resource for academic researchers, students and policy practitioners in the areas of global health, agriculture and development.